The CrossCut is precision instrument for cutting, personal care and the unexpected. SOG’s gear driven Compound Leverage allows for big-sized cutting power to be truly miniaturized. Open the handles and this micro machine is ready to work for you. Wait until you feel the action.Exclusive patented Compound Leverage generates twice the cutting powerSatin polished stainless steel handles and scissor..
Our Hex Bit Kit increases the possibilities for any SOG tool that comes with a 1/4” driver. With 12 interchangeable bits (Phillips, flathead and Torx) that fit most common fastener heads, your SOG tool just became a tool chest. Nylon sheath (NYL-HXB) available for convenient kit and tool carry in one package.Add on for SOG multi-tools expands the use of the tool to include major screw typesInclude.. The CrossCut is a precision instrument for cutting, gripping, personal care and the unexpected. SOG's gear driven Compound Leverage™ allows for big-sized cutting power to be truly miniaturized. Open the handles and these micro machines are ready to work for you. Wait until you feel the action! CrossCut features 11 everyday essentials which include: .. The Paratool is the only multi-tool with a multiple angled plier head capability. The unique, patented way the Paratool opens allows for the ability to operate at a variety of angles (140˚-180˚), indispensable in tight spots. The comfort grip handles are smooth on the outside and feature SOG’s classic ventilation holes for maximum gripping. Be prepared with the Paratool! 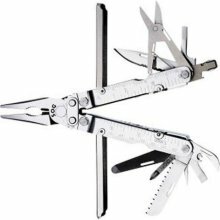 ..
SOG's Deluxe Pocket PowerPlier is packed with essential tools that include pliers/grippers, wire cutters, partially serrated blade, small/large screwdrivers, Phillips screwdriver, 1/4-inch socket drive, medium screwdriver, three-sided file, can opener, bottle opener, awl, rulers, lanyard and heavy duty nylon pouch. Exclusive interlocking gears are the driving force behind .. Lighter and more compact than its big brother, the PowerPlier, the Pocket PowerPlier is super easy to carry and use. SOG's Pocket PowerPlier is packed with essential tools that include pliers/grippers, wire cutters, partially serrated blade, small/large screwdrivers, Phillips screwdriver, three-sided file, can opener, bottle opener, awl, rulers, lanyard and heavy duty nylon pouch. Exclusi.. The new PowerAssist takes multi-tools to a new level. This is the first in the world to house not just one but two SOG Assisted Technology™ blades. Start to open the main blades, which are available when the main tool is closed, and S.A.T. takes over to complete opening. When not in use, these blades lock closed using our patent pending side release. Flip open the tool and experience the p.. The new PowerAssist takes multi-tools to a new level- it houses not just one, but two SOG Assisted Technology™ blades. Start to open the main blades, which are available when the main tool is closed, and S.A.T. takes over to complete opening. When not in use, these blades lock closed using our patent pending side release. Flip open the tool and experience the precision of the heavy-duty pl.. Welcome to the next generation of our best-selling PowerLock! Like the original, the newest generation includes patented gear driven Compound Leverage™, one-handed flip opening, a multitude of easy to access tools. New to this generation are several key features: First, a larger plier head with larger cutting surface... cutting with compound leverage just got better! Also notice a.. Using the proven PowerLock chassis, SOG is the only company to apply Compound Leverage™ technology to EOD(Explosive Ordnance Disposal). This makes it a breeze to crimp blasting caps and demolition cord with less hand pressure. Another unique SOG feature is the positioning of the crimper device within the confines of the handle...not in the plier jaw, like all other designs. This serves to .. Description: The PowerLock features removable, pivoting handle covers that improve the comfort profile for your hand. More pressure can now be exerted on those tough jobs! Thanks to the SOG-exclusive Compound Leverage gears, the PowerLock can be opened and closed with a one-handed flip of the wrist, keeping one hand free… and best of all, this mechanism creates twice the plier force..
As one of the original multi-tool manufacturers, we have learned quite a bit over the years. Like how to make the toughest tools with patented gear driven Compound Leverage™ mechanisms. You have let us know, that quick access is a must. Just flip our tools out with one hand and see for yourself how well we listened. Versatility in the field is a necessity and hex bolt construction provides..